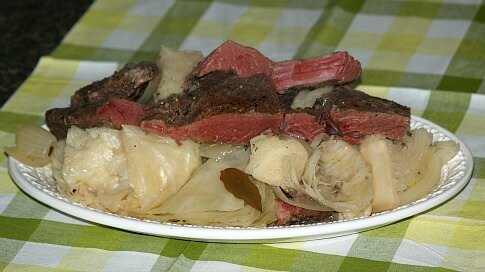 When I learned how to make the corn beef and cabbage recipe, I thought along with most people here in the United States, that this is one of the favorite traditional Irish recipes. I have been told, however that it did not originate in Ireland but here in this country; from the immigrants who settled in New York. No matter where this recipe came from, many of us cook this dish every year for our St Patrick’s Day menu. Although we consider corn beef and cabbage a must for St Patrick’s Day food, most Irish will tell you that they do not identify it as a traditional Irish recipe. The true Irish diet takes its influence, like most countries, from the locally grown crops and animals. Ireland is famously known for; its potato crops, cabbage and its high quality beef and mutton. These ingredients can be found in the Irish appetizers and entrees. Like people from most countries, the Irish brought many of their traditional recipes using their traditional crops, with them to this country. These recipes would evolve as they got acquainted with the available foods here. As with my family, some of these traditional foods give us a sense of “comfort”. My family always cooked a lot of cabbage dishes, especially in the summer when it was time for the cabbage to be harvested. A lot of the cabbage was also made into sauerkraut for recipes from our German heritage. We could enjoy these all through the winter months, especially during the holidays. Mom usually cooked the fresh cabbage with bacon or other pork, also from our German background. The Irish Americans who came here in the late nineteenth century learned how to make corn beef and cabbage recipes instead of using the bacon or pork with cabbage as we did. If you are learning how to make corn beef and cabbage, you might want to try making homemade corned beef. I have included a recipe for you to try. Just add the cabbage for a traditional Irish American corn beef and cabbage dish. Tie pickling in cheesecloth; place spice bag, salt, sugar and saltpeter in large saucepan. Add bay leaves, thyme and 4 ½ quarts water; heat gently until sugar and salt have dissolved. Bring mixture to a boil, pour into large bowl and let cool. Add meat to bowl making sure salt solution covers meat completely. Cover bowl with clean towels and set in refrigerator to soak for up to 2 weeks; turn occasionally. Remove meat from brine and wash thoroughly with cold fresh running water. Put meat into kettle with one onion peeled and spiked with cloves; add chopped celery to pan. Cover with cold water and slowly bring to a boil; skim top, reduce heat, cover and simmer 2 ½ hours. After cooking meat add remaining sliced onions; peeled and chopped carrots and turnips. Add chop leeks; return mixture to boil and simmer 30 minutes. If sauce is desired to serve, strain juices and thicken with a mixture of little flour and cold water. NOTE: ALWAYS SLICE CORNED BEEF VERY THINLY AGAINST THE GRAIN. WHEN HEATING CORNED BEEF, DO IT SLOWLY AND DO NOT OVERHEAT OR THE MEAT WILL BECOME TOUGH. Wipe the down the corned beef brisket with a clean damp rag. Place in a large heavy kettle and cover with cold water. Add the garlic, onion, cloves, peppercorns, mustard seeds and bay leaves. Bring these ingredients to a boil, reduce the heat and simmer for a few minutes; skim the top off and discard. Making sure the brisket is still covered with water; cover the kettle and continue to simmer for 3 to 4 hours, until the brisket is very tender. Slice corned beef and serve with cabbage. This corn beef and cabbage recipe is not like one you will find in your local restaurant. TO MAKE HOT SLAW combine in medium skillet cabbage, vinegar, caraway, salt pepper with water. Bring mixture to a boil; REDUCE heat, cover and simmer stirring occasionally for 5 minutes and drain. 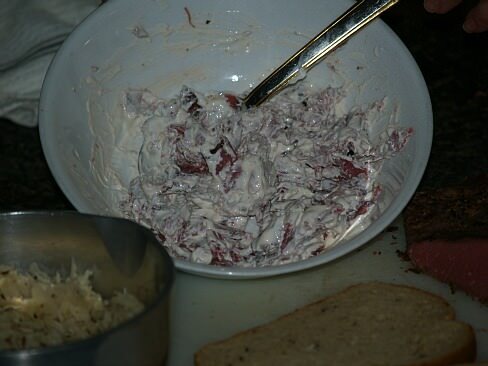 TO MAKE HORSERADISH SAUCE combine sour cream, horseradish, salt and Worcestershire in a small bowl. Add chopped corn beef to the bowl; stir to blend. 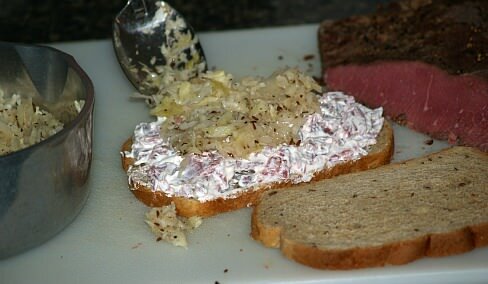 Spread half of corned beef mixture on each of two slices of the bread. 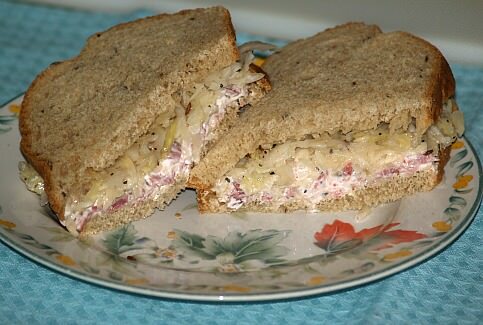 Top each with half of the hot slaw mixture; place remaining two slices of bread on sandwiches. NOTE: This is a pressure cooker recipe but you can also cook it on top of stove or in the oven; it will simply take much longer. Cook meat until tender; when almost tender, add the cabbage and potatoes. Cook until meat and vegetables are tender. Combine beef brisket, pickling spice and 2 cups water in a 6 quart pressure cooker. Cover with a lid and seal securely; place pressure control over vent tube. Cook over high heat until pressure control rocks back and forth occasionally; cook 50 minutes. REMOVE FROM HEAT; run cold water over cooker to reduce pressure; carefully remove lid. Place meat on a warm serving platter and keep warm. Add potatoes and cabbage to the cooker and cook as directed for 5 minutes; arrange around meat on platter. Combine sour cream and horseradish; serve with dinner. Combine all ingredients except cornstarch and corned beef in a large saucepan; cover and simmer for 1 ½ hours. Add a small amount of cornstarch to thicken; to each plate of cabbage add ¼ pound of corned beef. Brown onion in hot oil in a large skillet until tender. Add tomatoes and rice; stir to blend. Bring mixture to a boil; cover, turn off heat and let stand for 10 minutes. Stir in remaining ingredients; dump mixture into a greased casserole baking dish. Cover and bake for 30 minutes. Serves 6. Melt butter in a heavy cooking pot over moderately high heat. Add carrots and onion to pot; cook and stir until onions brown about 8 minutes. Add cabbage, chicken stock, sugar, salt and pepper; toss to coat. Cover pot and cook over low heat stirring until cabbage is tender about 15 to 20 minutes. Uncover pot, RAISE the heat to high; cook and stir until most of the liquid has evaporated about 5 minutes. Stir in corned beef, parsley and thyme; cook 1 minute longer and serve.